Two city measures appear on the San Francisco ballot on June 5, 2012. 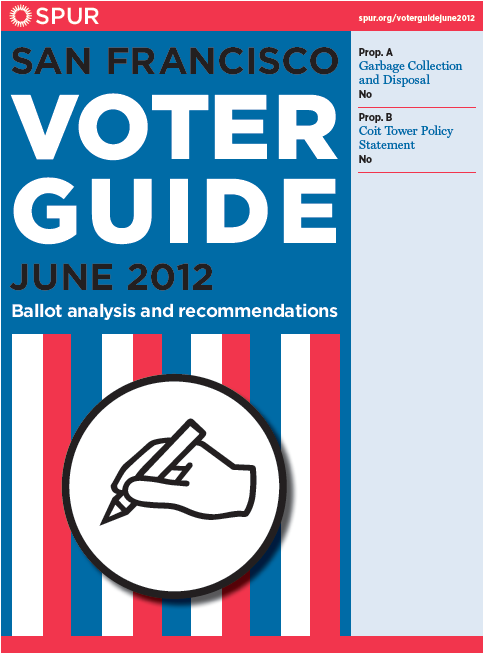 As we do every election, SPUR provides in-depth analysis and recommendations on each one. Our Ballot Analysis Committee heard arguments from both sides of the issues, debated the pros and cons, and provided recommendations to the SPUR Board of Directors. The board then voted, with a 60 percent vote required for SPUR to make a recommendation. For each measure we ask: Is it necessary and appropriate to be on the ballot? Is it practical, and if enacted will it achieve the result it proposes? And most important: Is it a worthy goal, one that will make San Francisco a better place to work and live?